CHICAGO – In our latest extra-special “get filmed by Fox” edition of HollywoodChicago.com Hookup: DVD, we have 10 DVDs up for grabs from 20th Century Fox as part of the studio’s “Million Moments: Great Moments, Great Causes” tour! Fox’s mobile van comes to Chicago on Saturday, Oct. 29, 2011 and Sunday, Oct. 30, 2011 at Kmart on 3443 W. Addison from noon to 4 p.m. on both days. HollywoodChicago.com winners will win five DVDs the first day and five DVDs the second day at the event from Fox’s catalog (i.e. “Napoleon Dynamite,” “Wolverine,” “Home Alone,” “Die Hard,” etc.). Also, our winners will have a chance to recreate some of the most memorable moments from your favorite Fox films! Every single person who submits a comment below will be awarded a pass to attend the event with the opportunity to be filmed, but only our first five winners to present our pass each day will take home a Fox DVD. The tour will donate 1 million moments from Fox’s robust catalog of DVDs to Chicagoland YMCAs and community investment partners across the country. Working in conjunction with Fox Gives (the company’s philanthropic arm), the tour travels to 18 cities over 14 weeks with the ultimate goal of donating 1 million DVDs. Come star in your favorite film! Some of the videos will appear here. HollywoodChicago.com winners will get the opportunity to recreate their favorite scenes from some of the most beloved Fox films including “Napoleon Dynamite,” “Wolverine,” “Home Alone,” “Die Hard” and more. Participants will be filmed against a green screen and the Million Moments tour van will double as a dressing room complete with hair, makeup and wardrobe. To win your free pass to the Chicago event plus for your chance to win a Fox DVD courtesy of HollywoodChicago.com, just answer our question below. That’s it! Directions to enter this HollywoodChicago.com Hookup and win can be found beneath the graphic below. 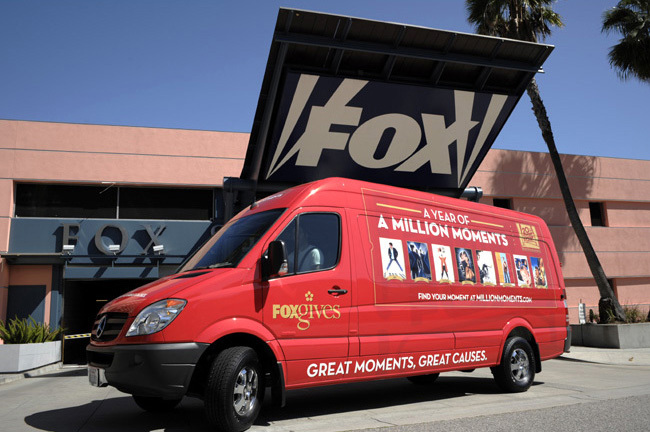 Fox’s Million Moments van comes to Chicago on Oct. 29 and 30, 2011 at Kmart on 3443 W. Addison. What’s your favorite 20th Century Fox movie moment? This Hookup is simple! Just submit your comment below and we will award unlimited event passes to these special two days in Chicago plus the first five HollywoodChicago.com winners each day will score a Fox DVD. Good luck! Submitted by Anonymous (not verified) on October 25, 2011 - 1:15pm. Submitted by plasmadog32 on October 25, 2011 - 1:44pm. Submitted by Annesa L Lacey (not verified) on October 25, 2011 - 1:45pm. Alien 3. LOVED the segue of the 20th Century Fox intro into the movie intro. I also enjoyed the 20CF intro segue into the sucky Johnny Depp Film “From Hell,” as well. Submitted by ronlipski on October 25, 2011 - 1:56pm. Edward Scissorhands carving ice while Winona’s character dances. Submitted by lwimmer on October 25, 2011 - 2:01pm. The ending of Silence of the Lambs when Hannible Lector tells Clarice he is having a friend for dinner. Submitted by ronsamuels on October 25, 2011 - 2:24pm. Submitted by Swimminsamiam5 on October 25, 2011 - 3:18pm. I’d have to say any of the Star Wars Movies. My mom, sister, and I went to see “Star Wars in Concert” and hearing that music live with the scenes from the movie was awesome!!! Submitted by Schpanckie on October 25, 2011 - 3:29pm. Watching the actors or actresses change roles. Here is an example. Gert Frobe, best known for “Goldfinger” but he was also in “Chitty Chitty Bang Bang” and with Sean Connery before Bond in “The Longest Day”. With this in mind, my favorite 20th Century Fox Moment is watching actors and actresses reinvent themselves. Submitted by chazziebelle on October 25, 2011 - 3:44pm. Submitted by Darrick (not verified) on October 25, 2011 - 4:05pm.